The classic challenge ride of just over 1,000 miles that takes you all the way from the tip of Cornwall, through some of the most scenic areas of the country, to the very top of the Scottish mainland. The trip starts at Land’s End, and from here the route takes you along the north coast of Cornwall, across Dartmoor and around Bristol. After crossing the River Severn you continue north through the rolling countryside of Herefordshire and Shropshire, around Manchester and across the wild countryside of Northern England to the Scottish border. After the hills of the Southern Uplands you pass through the centre of Glasgow, and continue through the glorious scenery of the Scottish Highlands, passing Ben Nevis and Loch Ness on your way to John O’Groats. We can offer a choice of routes on these trips; our original ‘scenic route‘ or a faster ‘main road route‘. Unless otherwise instructed we will use our scenic route for your trip. Roads & Terrain: Our Scenic Route follows minor roads as much as possible. The first part of the route through Cornwall and Devon is challenging with plenty of short steep hills. Around Bristol it becomes easier with gentler climbs, but the north of England is again hilly with a few tough climbs. The route through Scotland has some long climbs although generally these are not too steep. The route passes through plenty of small towns and villages, as well as a few larger towns which can be busy. To keep to a fairly direct route there are some unavoidable sections on main roads, most notably in Scotland, and some of these do carry moderately heavy traffic. The route through the centre of Glasgow is on local cyclepaths. The Main Road Route (XK10) follows a more direct, and slightly shorter, route as much as possible, generally using ‘B’ and secondary ‘A’ roads, but also quiet lanes and some busier main roads. You do pass through the centres of some large towns that the scenic route avoids. Inevitably roads are busier and traffic generally heavier. The route takes you through the same areas of the country as our scenic route and some of these are hilly; again most notably Devon and Cornwall. Note that the ten day trip is recommended only for very fit, experienced cyclists. If you would like to read other people’s comments on our holidays then check out the Customer Comments page. From the tourist complex at Land’s End follow the spectacular north coast of Cornwall, through pretty coastal villages and sandy beaches to Perranporth. A tougher day that takes you inland to Bodmin and then around the southern edge of Bodmin Moor, through the highest village in Cornwall, and across the River Taymar into Devon. A fabulous day that takes you across the wild moors of Dartmoor National Park and then along some beautiful winding lanes. An easier day that takes you into Somerset, over the the Quantock Hills and across the Somerset Levels to Cheddar. The day starts with a tough climb up through the famous gorge, the route then continues around Bristol and across the River Severn to Chepstow. The route takes you along the Wye Valley to Monmouth and then through the pretty countryside and ‘black and white’ villages of Herefordshire. Continue north through Herefordshire and into Shropshire, passing the Long Myndd and skirting around the edge of Shrewsbury. An easy day as you continue into Cheshire, passing through the Delamare Forest as you head towards Manchester. Cross the Manchester Ship Canal and weave your way north through the northern industrial heartland of England, passing between Liverpool and Manchester. Leaving behind the urban area behind the route takes you into Lancashire and across the Forest of Bowland to the edge of the Yorkshire Dales National Park. Continue north into Cumbria, passing through the picturesque villages of Kirky Stephen and Appleby-in-Westmoreland. The route takes you along the beautiful Eden Valley, across Hadrians Wall, and into Scotland. A long day that takes you through the hills of the Southern Uplands on some wonderfully quiet scenic roads. A day of real contrasts as you leave the quiet countryside behind and continue through of Scotland’s largest city, Glasgow. Using mainly local cycle paths you head through the centre of the city and then north to the shore of Loch Lomond. Continue through the beautiful hills of Argyle, crossing over the ‘Rest and Be Thankful’ pass to Loch Awe. An easy day that takes you through the Pass of Brander and along the shore of Loch Linnhe to Fort William, at the foot of Ben Nevis, the highest peak in the UK. The route takes you along the Great Glen, following the Caledonian canal to Fort Augustus and then continues along the shore of Loch Ness to Drumnadrochit. Head through the hills to Dingwall on the shore of Cromarty Firth, and then continue to Bonar Bridge. Continue through the hills of the Scottish Highlands on some wonderfully wild and lonely roads that eventually lead to Bettyhill on Scotland’s north coast. Accommodation in B&B’s or small hotels with breakfast. Cost of getting to the start / from the finish of the holiday. 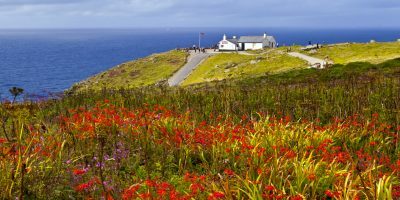 The Area: The journey from Land’s End to John O’Groats takes you from the extreme south western tip of England, through much of the finest countryside in the British Isles, to the very top of the Scottish mainland. The attractions of such a route are obvious and ever since the invention of the bicycle people have been inspired to ride the ‘End to End’. The first official time recorded over the distance is 65 days, 16 hours and 7 minutes, ridden on a penny farthing in 1880, and since then the route has been covered on everything from a bed to a motorised bar stool!! Today the record is held by Gethin Butler who in September 2001 covered the distance in an incredible 1 day, 20 hours, 4 minutes and 20 seconds. The ladies record of 2 days, 4 hours, 45 minutes and 11 seconds is held by Lynne Taylor. There is no ‘official’ End to End route and thus no official distance. There are various published guides – they all vary in the route they take, but most make the distance just over 1,000 miles (however some of the record breakers have managed to reduce the distance to nearly 850 miles, by using main A roads for much of the way). Most trips start from Land’s End, the main reason being that the prevailing winds in the UK are usually from the south-west, and so if you are lucky you could have a tail wind all the way to Scotland. The Tour: This trip is designed to offer you the challenge of riding the End to End. The shortest route from Lands End to John O’Groats involves riding a lot of main roads. Our route is designed to be a compromise. 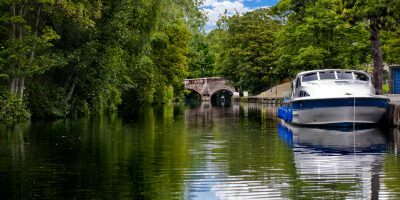 While it is still a fairly direct route, we have tried to include some of the most attractive areas of the UK, and avoid busy roads as much as possible. Parts of the route are hilly. We have avoided hills if we can, however if there are hills in the way, we have generally taken the route over them rather than add additional miles by taking the route around another way. The route does take you through some large urban areas – in particular as you pass around Bristol, Manchester and Glasgow. This is unavoidable if you wish to take a fairly direct route, and again we have taken the route through such areas rather than add additional miles by trying to avoid them. You should note that this trip is not recommended for inexperienced cyclists. Parts of the route are hilly and you should be prepared for it. Most people do find that they get fitter during the tour, but some of the hardest parts are the first couple of days through Cornwall and Devon, where there is a lot of up and down. Accommodation & Food: Accommodation is in small hotels, guest houses and B&B’s. All the accommodation is privately owned and run, and as such does vary. There are some wonderful old historic houses, farmhouses, small cottages and Edwardian town houses. Some are in the centre of towns or villages, others are in small hamlets with few local amenities. We have tried where possible to mix types of accommodation so that you will get to try various different styles on each trip. Note: If you are booking a trip by yourself, or are part of a group but have requested a single room each night, there is an additional supplement of £20.00 per night. In most establishments en-suite facilities are standard and we include these where possible, but this cannot be guaranteed. Breakfast is included at all the accommodation. Most establishments offer a full ‘English’ (or ‘Scottish’) breakfast, but will be happy to adapt this to suit you. No other meals or drinks are included in the cost of the trip. The accommodation has been chosen so that there will be somewhere nearby for a meal in the evening. While riding there are frequent small villages in most areas and so finding somewhere to stop for a drink or some food is not usually a problem, although in some parts of the country, particularly Scotland, settlements can be quite a long way apart. The Start: Getting to Land’s End (and back from John O’Groats) is a problem for most people undertaking an End to End trip. Unless you have a willing friend or family member who will drive you, or you want to do some training miles by riding there, then the easiest way to get to the start of the tour is by taking the train to Penzance, which is served by Intercity trains from London and various other cities. It is approximately 10 miles from here to Land’s End. There is plenty of accommodation available in Penzance, or in the village of Sennen which is about a mile from Land’s End.Note: The price of the trip does not include accommodation for the night before the start of the holiday or at the end of the holiday (ie at Penzance/Sennen or John O’Groats). The Finish: The easiest way home from John O’Groats is again by train. The nearest station is at Wick, which is connected by a local service to Inverness (Note: There is a limited service on this route with only a few trains each day and it takes several hours to get to Inverness). From Inverness there are Intercity trains to most parts of the UK, and ‘low cost’ flights from the nearby airport to several UK cities. 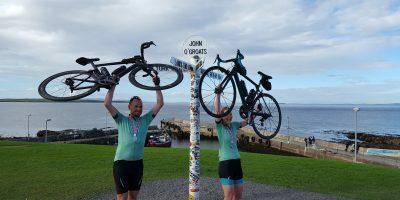 Depending on the time you reach John O’Groats it is possible to start your journey home that day however you should be aware it is an 18 mile ride to Wick and you should make sure that you allow time for this. Most people spend the night at John O’Groats and begin the journey home the following day. Documents: Insurance is optional on this holiday for UK residents. Non UK residents are required to have suitable insurance cover for the duration of the holiday. Bikes: The type of bicycle that you bring for this tour is entirely up to you. Some people take mountain bikes, others touring machines. The most important thing is that your bike functions properly and that you are comfortable riding it. You should make sure that your bike has suitable gears for this sort of trip. Parts of the route are hilly, with some steep climbs. Do not forget that you will be carrying your luggage, which may mean that you need a lower gear than you would normally use. Most people will find that they are most comfortable with a bottom gear of about 25 inches, which will usually mean having a triple chainring. Weather: Nobody needs telling that the weather in the UK is notoriously unreliable. However visitors may be surprised to learn that hot summer days are not uncommon, and there are often prolonged dry periods. Average summer temperatures are usually in the high teens or low twenties in the south of England, with the north of Scotland averaging a few degrees cooler. The weather in May and June is (statistically at least!) the most reliable, and this is also usually the driest time of the year. Unfortunately this cannot be guaranteed and you should be prepared for wet weather whenever you go (particularly in northern Scotland which can be cold and wet at any time of the year). If you have any questions about any of our trips, please call us on 0800 002 9559 or send us a message below.